Just like any other app on Shopify, Loox requires certain permissions to provide its service. View Shopify account data - To create a Loox account for your store that includes information need, like your store URL, locale, and currency format. 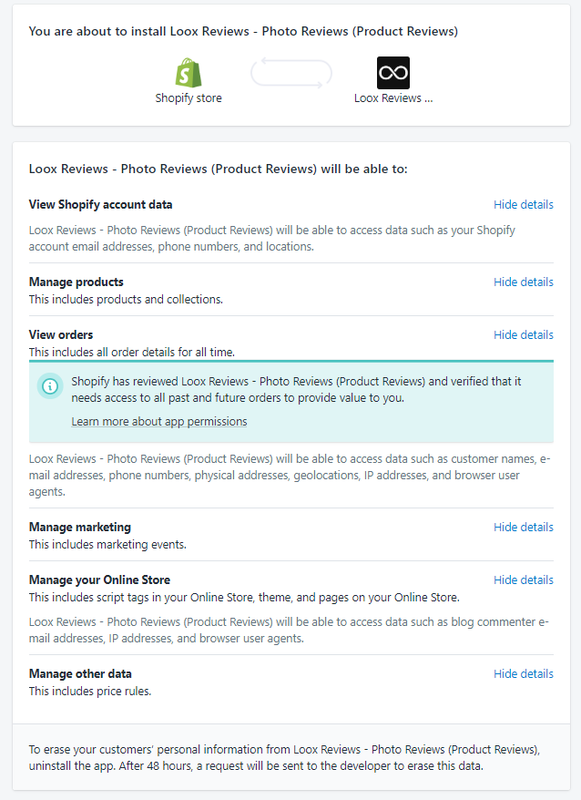 Manage products - To check if a product still exists (to refrain from sending review request emails to customers for deleted products), to fetch product photos (included in the review request email) and to calculate Loox Driven Sales revenue. View orders - To fetch orders data required for scheduling review request emails - customer name, customer email, order date, products purchased, fulfillment status, etc. We request all-time access in order to send bonus requests to past customers when you install. Manage marketing - To reflect revenue generated for your store driven by traffic Loox sends your store (from review requests, social media, etc.) on your Shopify admin, using Shopify's "Marketing Events". Manage your Online store - To integrate Loox into your store and to display the various Loox widgets on your storefront. Manage other data (Price rules) - To set up, display and offer discounts to customers that include a photo in their review. If you have any questions regarding specific permissions that are requested, please contact us and we'll be happy to help!